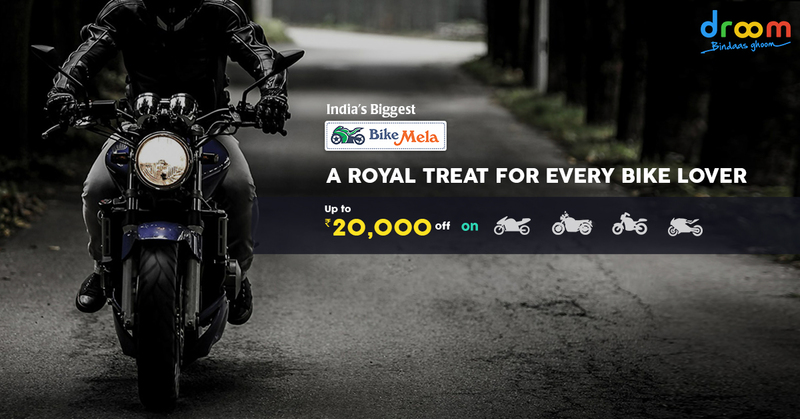 Droom offers a royal treat for every bike lover with IBBM – India’s Biggest Bike Mela! If you are a bike enthusiast looking to own your dream bike, look no further! Droom, India’s pioneering online automobile transactional marketplace, has announced the launch of IBBM – India’s Biggest Bike Mela to make bike ownership more viable for the country’s consumers. The campaign is scheduled to run on April 26 and April 27, 2016 on Droom’s web and app platform. The IBBM will feature hot deals and discounts on bike purchases across categories such as superbikes, sports bikes, cruisers and standard commuter bikes, depending on the category and purchase price. Each purchase is offered by verified sellers on Droom’s platform, and also comes with a free Road Side Assistance to add even greater value for the buyer. India’s Biggest Bike Mela from Droom follows the immense success of its previous Bike Melas, and will look to build upon the strong showing of its previous editions. Sports bikes such as Bajaj Pulsar, Yamaha R15, Yamaha FZ, Yamaha Fazer, CBZ xtreme and TVS Apache will be available at a discount of INR 4500 for a minimum purchase price of INR 35000, while Royal Enfield models such as Classic, Standard and Thunderbird can be bought at a slashed price of INR 12000 for a minimum price of INR 1 lakh. A flat discount of INR 3500 can be availed for a minimum price of INR 28000 for Standard Commuter Bikes such as Hero Passion, Bajaj Discover, Hero Splendor, and Honda CB Shine. Consumers purchasing superbikes from Kawasaki, Yamaha, Hayabusa and Ninja will benefit from a discount of INR 20000 for a purchase of INR 2 lakh. Buyers can freeze their deals by paying a fully refundable token amount on Droom before completing the transaction directly with the vendor after verifying the vehicle. Digitally Connected Cars: How will it make driving more personalised?